You know how race cars make that satisfying clunk as they go into gear? How they whine as they fly by? Well, now you’re gonna see and understand exactly why that is. 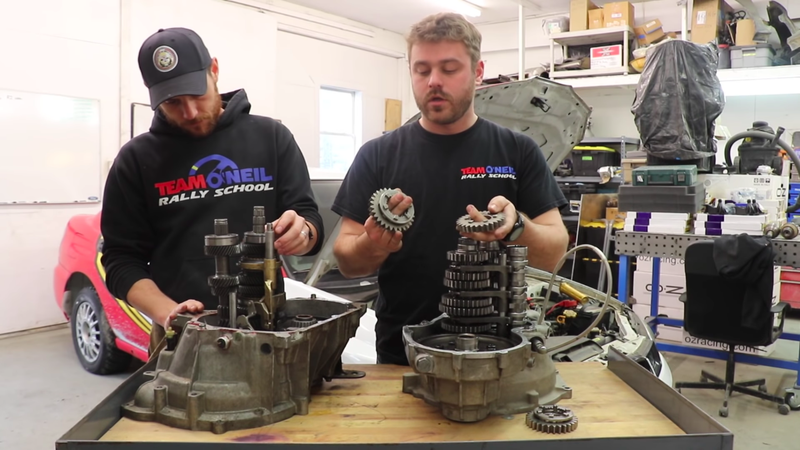 Team O’Neil Rally School opened up a stock Ford Fiesta manual transmission next to a super trick Sadev sequential race transmission, and their own rally experts Wyatt Knox and Dan Downey (who you may remember from this) explaining how both work, and how the two differ from each other. As a reminder, if anyone is going to understand something about going fast, or making a car do black magic, it’s a rally driver. Or maybe the rally mechanic who has to fix everything on the side of the road. The main point of the street car transmission is everything is designed for ease of use. It uses helical gears cut at an angle that are quiet and engage smoothly from gear to gear. The problem is that while this setup of gears is easy to use, it’s only meant to be shifted so fast and to put up with so much power. If you want to slam through every gear, if you want to put a ton of power to the wheels, you’re going to have to be very, very careful with how you shift in a stock transmission and be ready to have a spare when it blows up. The main point of the race car transmission is everything is designed for strength and speed at the expense of ease of use. And cost. This Sadev transmission doesn’t look too different from the stock transmission from the outside because it has to fit onto the same car (a Ford Fiesta) in the same space under the hood. The race transmission has straight cut gears. These are loud and whine. You’re familiar with this. It’s the whirrrrrrrr noise your car makes in reverse. That’s a straight-cut gear. Also look at how much bigger and burlier the straight-cut gears are than the helical street ones. It’s easy to see how they are stronger and can take more power. The race transmission also has dog rings instead of synchros. Instead of soft teeth on a ring, you get big, hard “dog ears” of metal that pop in and out of place. Look at them in the video and you’ll understand why there’s that ultra-satisfying ca-chunk sound of metal-on-metal when a race car pulls up to the line and goes into gear. Gear-to-gear, this setup is stronger, more able to reliably hold bigger power, and can be really slammed from gear to gear. Driving a street transmission like a race transmission, as Wyatt Knox points out, could blow the thing up in 12 shifts if you were really trying. By the same token, the race transmission has less room for error, which you can see physically in this video. There’s less guiding you from gear to gear, and it’s easier to mis-match things, or not be forceful enough and then blow up the race transmission shifting it like it was something for the street. You’ll also see why you have to lift off the gas (or have a programmed-in “flat shift” that cuts ignition) when you want to shift a transmission with dog rings. You need to get those ears to space out and disengage from each other, something that’s easy to see when the whole thing is apart. Even then, though, a race transmission like this can be seconds faster per shift than a street transmission. When you’re thinking about how much work it takes to make a race car seconds quicker per lap, the cost of this Sadev makes sense. Dropping $20,000 on something seems ludicrous, but it’s a sensible investment for a serious race team.